Jill Outside: Too warm for biking? Temperatures here have started to inch just above freezing again - which means slush everywhere. 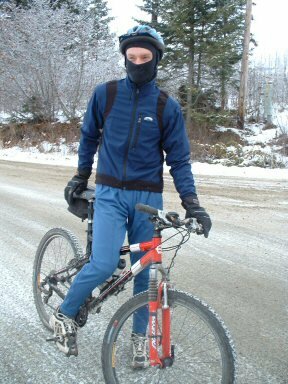 Yesterday I finally convinced Geoff to go winter biking with me, but my "it will be great now that it’s warm" argument backfired. As we dropped off the ridge, we were bombarded with black goo, mostly melted snow mixed with dirt and gravel fragments. Pretty soon I was only able to keep one eye open, then only half open, and my steering wobbled as I furiously wiped mud from the small part of my face still exposed to the elements. When we reached town I was laughing out loud and Geoff was looking at me through his mud-caked bike mask, obviously annoyed. I know what you’re thinking - fenders, Jill, fenders! But acquiring gear doesn’t happen overnight, especially when you live in a town that doesn’t even stock underwear. I still need to buy studded bike tires and biking booties and gloves (all I own now is a pair of mittens.) And I need a tail light and long johns and weatherproof pants, and maybe one of those hats to go over my helmet, and while I’m at it, I remembered that Geo needs a new clutch and some shocks and I just bought cross country ski boots online that arrived as size 42 - 42s! Who even knows what size that is, but they’re entirely too big for me. In conclusion, fenders are on the short end of a long list, so here’s hoping the cold snap comes back. ya'll is still nutz in my book. Wow, I could really use some of your energy and motivation! 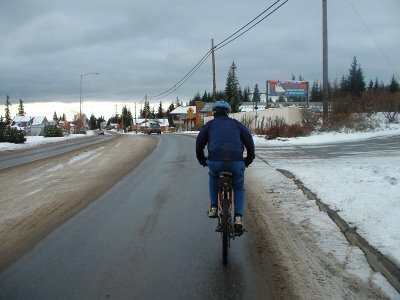 I have a hard time biking at the Alaska Club. Meant to be the coldest winter in 40 years here in London. A recent arrival from relatively toasty Australia, I'm crossing my fingers for SNOW!! !